I love flowers! Here in Florida the annual plants are coming out and blossoming everywhere. This little piece is a study I did in one of my past Friday morning classes. We started by using graphite to transfer a little drawing that I did onto some Arches 140 lb. watercolor paper - 10 x 14 inches. 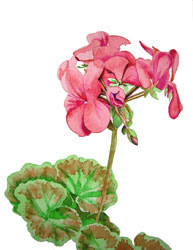 Then we began light washes of pinks, reds and greens to develop the petals and leaves. Each layer, or glaze, must be allowed to dry before applying the next if you want to develop crisp lines. Other areas were worked a little wet-in-wet. Pigment is added to a damp or wet area so that the edges of the colors soften and float into one another. The brown in the leaves was created by adding some burst sienna after the greens were completely dry. I let my brush dance over the area with a wet pigment, then dabbed at the moist areas here and there with a damp brush to lift and soften in a few places. I really enjoy the play and interaction between the very soft bristle brushes and the pigments. This was a very fun study to work on. I think my students enjoyed it as well. For more information on my artwork and classes, visit my website at: http://watercolorworksart.com.